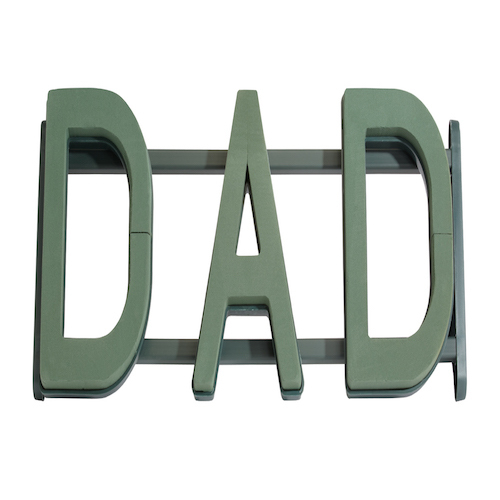 Looking for a unique way to celebrate your Dad? With OASIS® Floral Frame you can do just that. Simply soak the foam, arrange your flowers and display. Honor your dad on his birthday or display in memory of him with an outstanding arrangement made easy with this "Dad" frame. Pair with some of our beautiful blooms and create an unforgettable floral tribute, perfect for any event. The OASIS® Floral Frame features OASIS® Floral Foam Maxlife precut into letters. They have been sonically welded to super strong injection mold bars for secure hold. They come with an easy-to-attach support stand for two optional set-ups. Ideal for birthday parties or use on caskets, graveside, or special occasion.